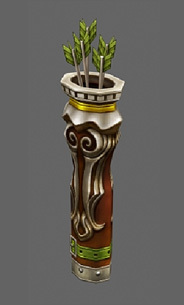 - Assist Weapon Item will be added for Elf. 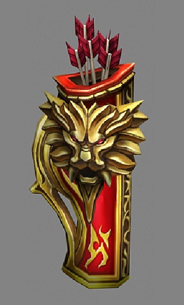 The weapon assists DMG of Bow/Crossbow items. ② Quiver item has DMG and attack speed stats. There are normal, excellent, socket and mastery items. ③ There can be luck, additional DMG options. Option generation and effects are the same as other items. ⑤ Quiver item's DMG and attack speed is only applied together with bow and crossbow items. Excellent and socket options are always in effect. ① Bow item that used to be equipped on the right side, can now be equipped on the left slot. ② Quiver, Arrows and Crossbow items can be equipped on the right side of the inventory. ③ Arrow item that used to be auto-equipped with bow and crossbow items will be equipped automatically if the slot is empty when your character starts attacking opponents. * Quiver item is not automatically equipped. 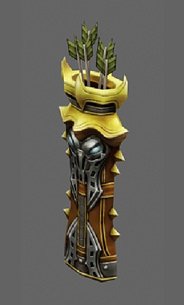 * Elf characters that have been using bow and crossbow items should move the weaponto the left slot. ① After Season12 P.1 update, monster drop socket items can have up to 3 socket slots. EX) - You cannot equip Dark Stinger 5 socket item with Quiver 3 socket item. - You can equip Dark Stinger 5 socket item with Quiver 1 socket item. - You can equip Dark Stinger 3 socket item with Quiver 3 socket item. ① New combination to decrease socket items with 4 or more sockets to 3 socket items. ③ Seed Sphere items should all be removed in order to operate socket decrease combination. All information other than socket slots will be maintained after the combination. 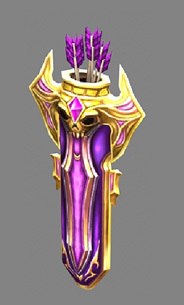 - Supporter Type Elf, Mage Type Magic Knight's Bloodangel Mastery Item will be added. - Mastery item crafting and upgrading method is the same as before. ① Applied when options are activated by equipping the set items. ② The option is applied through using the following skills: Greater Damage, Greater Defense and Bless. Strengthener DMG Increase skill effect is strengthened by the % value of the set option. Strengthener DEF Increase skill effect is strengthened by the % value of the set option. Bless Reinforce Bless skill effect is strengthened by the value of the set option. ① Bloodangel Armor items will be added as dual class 1st mastery combination material. ② The updated Sealed Bloodangel Item is available from NPC James in Elbeland for 30,000 Ruud. ① Elf, Magic Knight classes can transform Mastery Items. ② For Elf, transformation is possible between Attacker type Set Armor and Supporter Type Set Armor. ③ For Magic Knight, transformation is possible between Gladiator Type Set Armor and Mage Type Set Armor. ① You can transform Elf and Magic Knight's Mastery Set Armor item through Chaos Goblin NPC at Noria. ① Dark Spirit that used to be equipped in the shield slot on the right side, can now be equipped in the inventory. ② Dark Spirit item can be equipped and unequipped by mouse right click in the inventory. ③ Dark Spirit and Shield item can be equipped at the same time. equipped/used in the inventory with mouse right click.